Toddlers’ Workshop is a child development programme for toddlers of 3 months to approximately 4 years. The programme for toddlers 3 months to 22 months is different to the older age group. A toddler is a perceptual motion machine. At the workshop the toddler can move forward in a “yes” environment encouraged by the fun-filled experiences to be found at every step of the way. The workshop enhances the child’s sense that the world is a safe and exciting place to explore. Toddlers’ Workshop – Baby Group is the result of many years of development, starting with toddler groups in Green Point, Cape Town, where Celia Kossar, a teacher psychologist and remedial teacher with experience in family therapy, now the principal of Toddlers’ Workshop, designed the toddler programme. Together with her husband, Otto, an educationalist, they combined a psychological approach with an emphasis on the concept that “acceptance is the key to growth”. In 1988 the first experimental baby group developed at Green Point and gradually developed a recognition of the strong need for motion in early childhood. Over the years the programme has been refined and developed, and new and better equipment has been designed to enhance the child’s sensory – motor integration process, the basis for all higher learning. 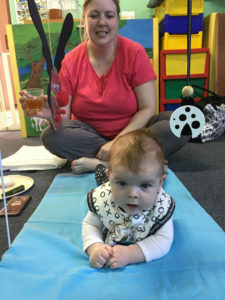 Programming has been designed to take toddlers step by step through early motor development while educating the parents so that they become more aware of what to expect and when. The awareness of the sequential nature of developmental stages helps to reduce the negative psychological stress that results from unrealistic expectations. The basic motions of jumping, rocking, spinning and balancing are as essential to the child’s growth as food. Often in the home the child hears “NO!” when attempting to “feed” his or her needs. At Toddlers’ Workshop we say “YES!” to those needs and help the child and parents to understand the basic nature of those requirements. A group play period where the mother’s primary focus is on her baby. A music period where simple repetitive songs provide fun-filled learning experiences. Snack, tea and outdoor time. This provides an opportunity for mothers to catch up on their news. It enriches the mother’s repertoire of educational skills and activities at home. It provides a social experience, information and opportunity for discussion of relevant issues for mothers.